I just tried to download the voice over IP software Skype from the official website to discover that I had to log in, or create an account, to do so. That was an annoyance and I decided to go to Betanews to download the software instead. I had been a Skype user before but somehow ran into a problem that shut down Skype right after start every time I would run it. After cleaning up all leftovers on the system I decided to give the program another try, which worked this time. But instead of just opening the Skype window a second window was opened on start. Skype Home opened as a popup on Skype start. I cannot really say what it is for, maybe for advertising new features or for making Skype more social. I have no idea to be honest but know that it does not look really useful to me. Problem is: Skype Home opens every time I start Skype. Even worse: There does not seem to be a setting to disable Skype Home from starting up with the Skype software. That's a big usability issue right there. Andrew Worcester, fed up with clicking the close button of the Skype Home window, has created a small portable application that kills Skype Home as soon as it pops up. Skype users basically start Kill Skype Home first before they start Skype. The application by default runs until a Skype Home window is detected. It will then close the Skype Home window and terminate itself afterwards to free up the resources on the PC. Andrew has added a persistent mode to his application which disables the termination of the Kill Skype Home application after terminating the Skype Home popup window. Skype needs to be run in compact view mode for the Kill Skype Home program. Users can make sure of that by clicking on the View menu entry in the menubar. If they see Default View listed there near the bottom they are running compact view. 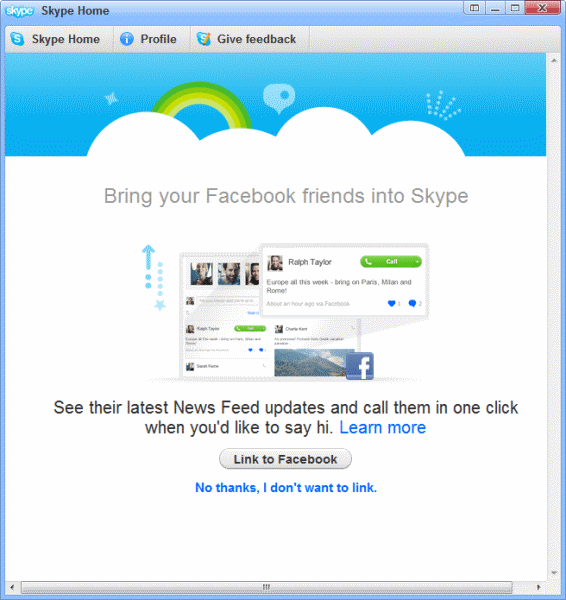 The reason for this is the following: Skype users who are running the default view mode see only one window that combines the compact interface and Skype Home. This makes it impossible to close down only the Skype Home part of the window. Today I got the update with Facebook tab opened, and I never asked for that. So I recalled a tip I saw yesterday on Lifehacker.ru (Russian branch) – “just install Skype Business version” and did just that. Yahoo! No Facebook tab in business version! Skype went crazy and become annoying this year. Did you try business version, Martin? Maybe it is a temporary solution, but it worked for me today. Roman that’s interesting. Will try asap. Update: Does not seem to work for me, unfortunately. I doubt Microsoft has had an impact on that. @Martin: Why not try a better alternative to Skype – Brosix IM seems more secure and easier like Skype. The main reason is probably that a few of my contacts use Skype, and that I do not think that I could convince them to migrate. The first time I updated Skype and discovered this I reverted to the previous version and have stayed there. I can understand developers wanting to improve their software but there seem to be quite a few of them doing the opposite recently, at least from their users point of view. My normal practice if it proves impossible to avoid these things is to uninstall the program, there are very few these days you cannot find alternatives to. I keep a text list of programs I will not update through things like this, there are two dozen names on it and Skype is one of them. The best option for now is reverting to an older version. After all, when was the last time they added a “feature” you actually needed? A search for “old version skype” should give you a good list of earlier versions and places to download them from. If you’re not comfortable with downloading from a third party, you could get them from skype. Just edit the link above to match the version you want, and Bob’s your uncle. Obviously, the long-term solution is to abandon Skype in favour of something based on open standards. Your concerns about contacts being reluctant to migrate, might be valid for now. It seems, however, that Skype themselves are doing their best to convince them. Which exact version are they referring to? :) The latest is 5.5. Or is the Home window only in the recently released newer build of 5.5? I have an older build of 5.5 but I am not getting that home window. You are very fortunate because it started when the main version number changed from 4 to 5.
some dissident group of programmers to start their own thing. I’ll stick with what I’ve got, unless they actually change things in the program it means going through that every time it updates. Terrific! Works fine! Just have to see to that Skype does not automatically update itself!